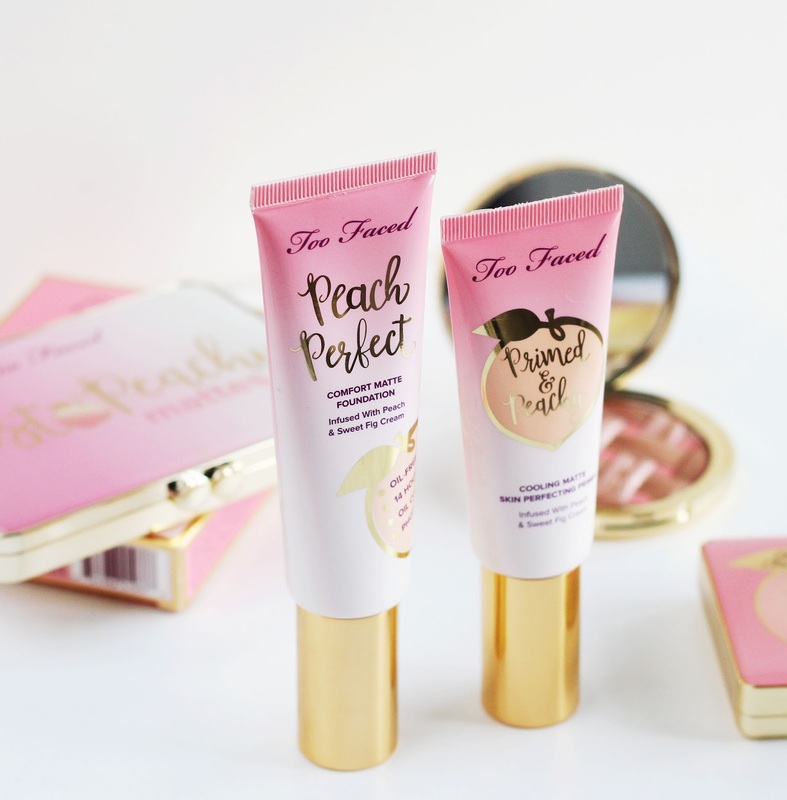 I had been waiting what felt like an age to get my make up loving mitts on the Too Faced Peaches & Cream collection. After the UK launch date (in Debenhams) came and went with no sign of it, I eventually caved at the beginning of the year and did a little Sephora haul. 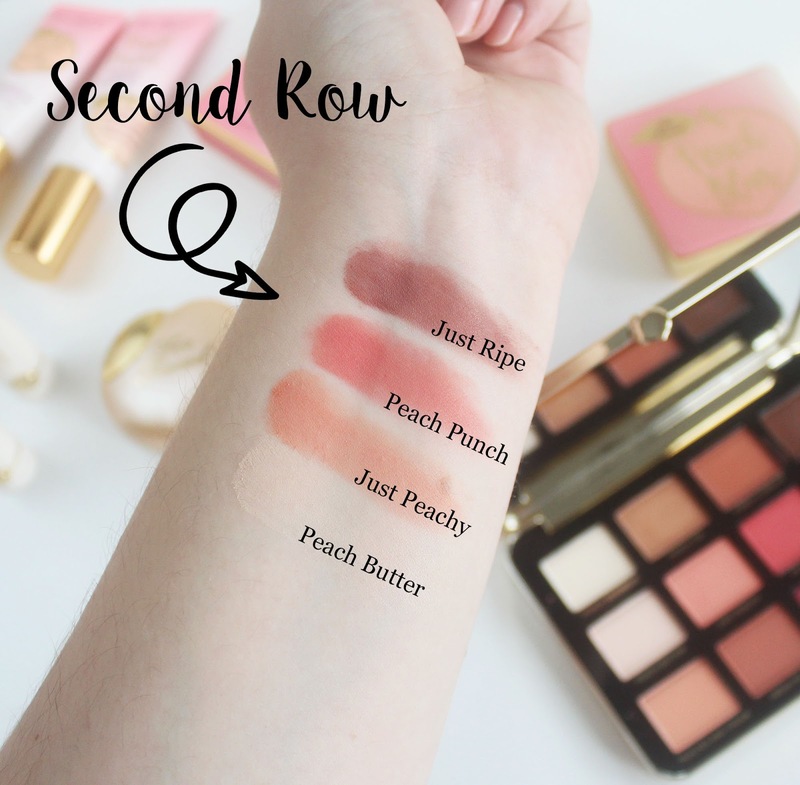 So for the past 3-ish weeks I've been trialling a lot of the Peaches & Cream collection and I'm so excited to finally be able to give my thoughts. This is a "cooling matte perfecting primer" and yes, I agree with all of those claims. It's definitely mattifying, pore filling and smoothing (see: perfecting) and it does also have a cooling sensation when it's first applied. My concern about the latter is: why? What is the point of a primer having a cooling sensation for 10 seconds after application? This just seems like an unnecessary gimmick to me, but if you can think of an advantage to a "cooling" sensation then do let me know. 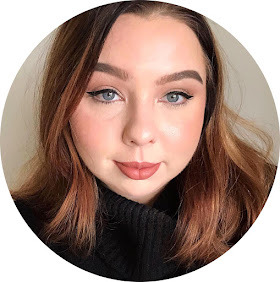 What I do enjoy about the primer is that it really is brilliant at smoothing and mattifying my T zone, as well as blurring any imperfections like texture and pigmentation. I also definitely feel like it helps my make up to last longer, I haven't put the "16-hour+ long wear" claim to the test but I have put in a good 8-9 hours and found my make up has come out on the other side flawless. Not only that but I actually feel like my make up is stuck to my face, but not in an uncomfortable way? It's hard to describe but yes, definitely improves longevity! Never again will I read the reviews and ignore them. Everyone in the review section was complaining that the lightest colour Snow, which I purchased, was not a light colour. When I opened it out of the box and first did a colour match on myself, I remember thinking "well the reviews were wrong then" because it was a very pale shade with yellow undertone that matched my fair skin spot on. However about 10-15 minutes after I'd applied it all over my face, it had oxidised like crazy to the point that I wouldn't have considered it a light colour either. I'd say I'm on the darker side of the fair spectrum, I see women all the time with far fairer complexions than me, so I can just about get away with it when I apply a dash of bronzer down my neck. However any paler than me I think you'd end up with a very serious case of orange demarkation lines (or as they were known in my secondary school, "slag lines"). It's a shame because the formula is actually pretty good. It's described as medium coverage but I was really impressed and would definitely still recommend it to someone who wants to cover pigmentation (like me!). The finish is matte and as I have combination skin (oil prone T zone and forehead, dry cheeks and under eye) I did find it a little harsh on my dry areas, as in it felt a bit starchy after a while, not that it cracked or clung to dryness. But it was brilliant at staying put on my oily areas. I imagine it'd be an absolute God send to someone with oily skin who struggles to find foundations that are mattifiying and long wearing. So it's a shame about the oxidising issue. I think this will be perfect for summer time though when I need a sweat proof foundation. As someone with dry skin, I love to create the illusion of glowy, dewy skin with make up. I have a number of illuminating finishing powders in my collection, from Chanel to Nars, with the Peach Blur powder being the latest addition. I have to say that I love it! It's such a thin powder that it's untraceable on the skin, it leaves no texture at all, nor does it grab onto any texture on my face. It's an extra step in my make up routine and despite the fact it's a powder, it doesn't lead to excessive looking make up or 'cakey' build up. What it does do is leave a really beautiful sheen, with a very subtle peachy tint when the light hits your face just right. This is definitely in my good books and I highly recommend it to anybody that wants to achieve a glowing but natural looking complexion. This is a really pretty bronzer, and one out of the two that Too Faced launched as part of the Peaches & Cream collection. I chose this one because it's looked so unique and beautiful. It's made up of multiple tones; a pale bronzer and a coppery bronze shade with tiny flecks of golden micro shimmer, intertwined with a matte blush pink. It creates such a pretty sunwashed warmth, I love it. It's just a really good bronzer, Too Faced definitely did this one right. This has got really bad reviews on Sephora, and to be perfectly honest, I'm not entirely surprised. That being said, I actually did get on with this. I think the issue is that this formula is, to be blunt: weird. It's cream to powder but literally as soon as you touch it it's powder. It's difficult to apply with fingers because it melts too much and you get literally no pigment, but it's also not powdery enough in the pan to be able to pick up the pigment on a brush. I apply it by pressing my damp beauty blender into the product, and then patting it on my cheek bone. You do need to press and pat it in, the powder is quite dry (despite starting as a cream?) so you can't really blend it in sweeping motions. I found this way actually did work and made it look really nice. It's not a blinding highlight, it's very subtle but you can see it reflect the light when you turn your face. It's perfect for sculpting, in my opinion. Whilst I found a way to get on with this product, I'm not convinced it's worth the hassle; it's nice but difficult, and not really practical to work with, I doubt I'll be reaching for it a whole lot. I'm glad I didn't bother with the blushes and bronzer if the formula as the formula is the same. 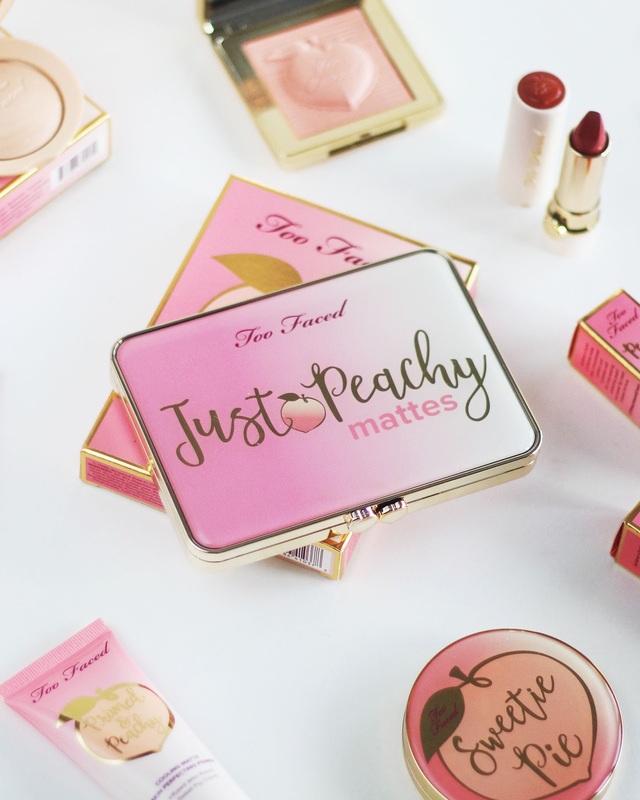 We all know by now that Too Faced tend to be fantastic when it comes to eyeshadows, and the Peachy Mattes palette is absolutely stunning. Obviously it's a matte palette, so I was surprised to find that Peach Sangria has a slight sheen to it? Regardless, all the shades are gorgeous and well curated, there are easily a lot of looks in this palette. All the colours are richly pigmented, the fall out isn't too intense, and they're easy to blend - it's a really, really good eyeshadow palette that is an absolute staple to me now. Especially the shades on the top row, which is what I tend to use for an everyday smokey eye look. I have the shades Make Up Me Happy* (bright pink), Got Peach? * (punchy mauve) and Where My Peaches At? (bright red). 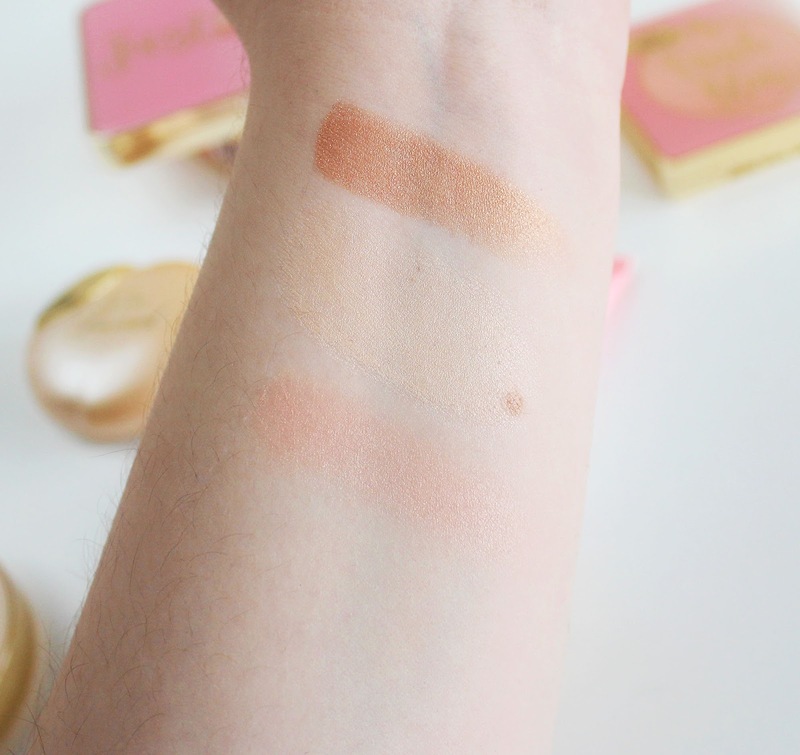 I haven't swatched Make Up Me Happy because I know the shade won't suit me (any 'Barbie pink' shades just don't suit me, I think it's the blue undertone that isn't flattering on me! ), so instead I've popped it into the Valentines giveaway Alix and I are running. 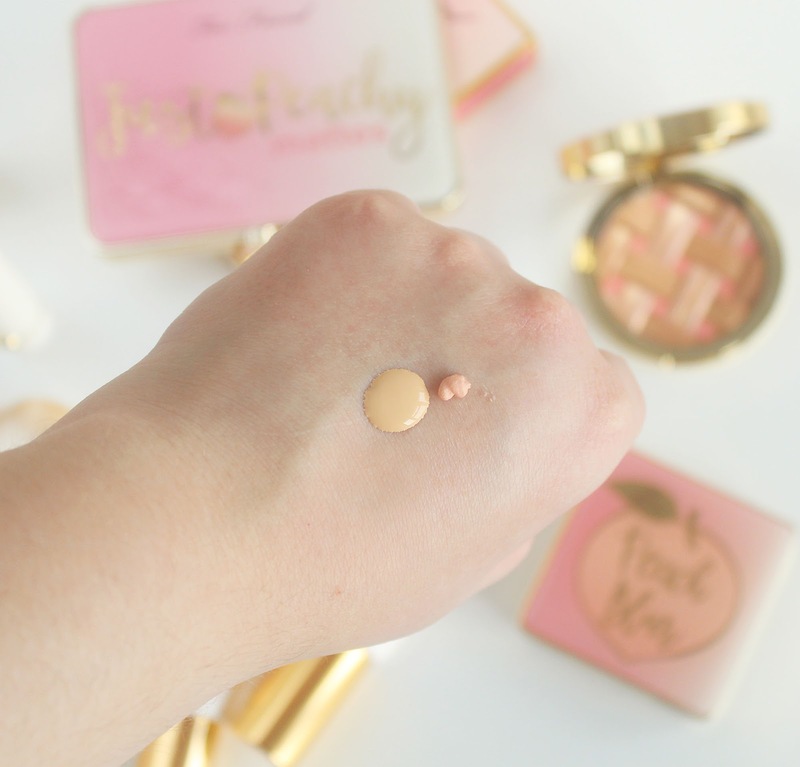 You can also win a Peach Blur of your own, so make sure you check it out! Top to bottom: Where My Peaches At? / Got Peach? 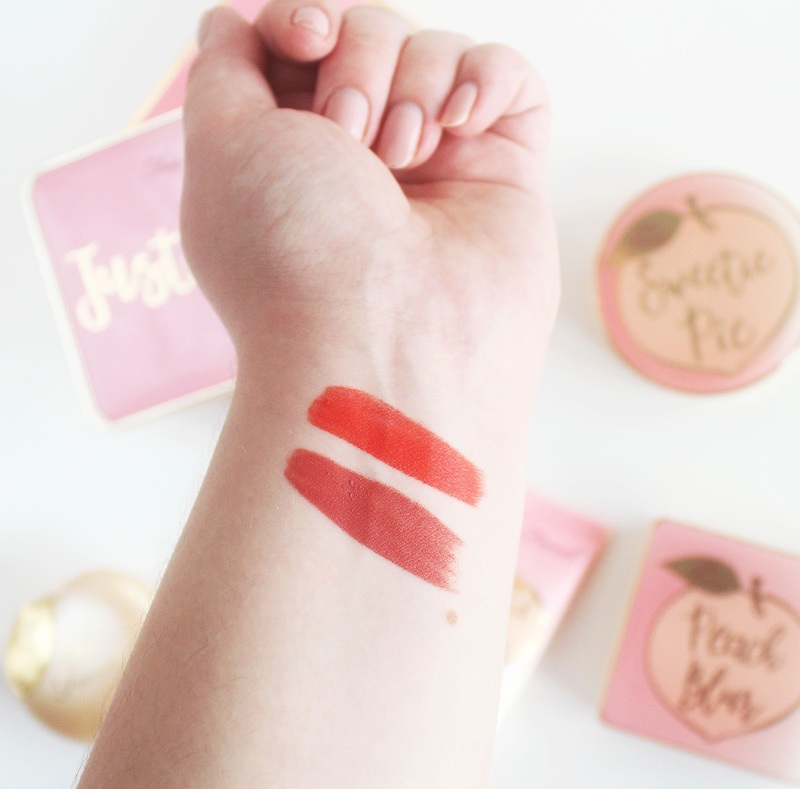 From the two shades I have tried, I have absolutely fallen head over heels in love with these lipsticks. As soon as these are easily accessible in the UK or when I'm planning another US order, I will be getting several more shades. The formula is just so beautiful! They're super opaque, have a beautiful soft matte finish, have a plushy feel to them and are incredibly comfortable to wear. Honestly the formula reminds me of Charlotte Tilbury's Matte Revolution formula, but with even more glide to them. These really are gorgeous, and I highly recommend them! 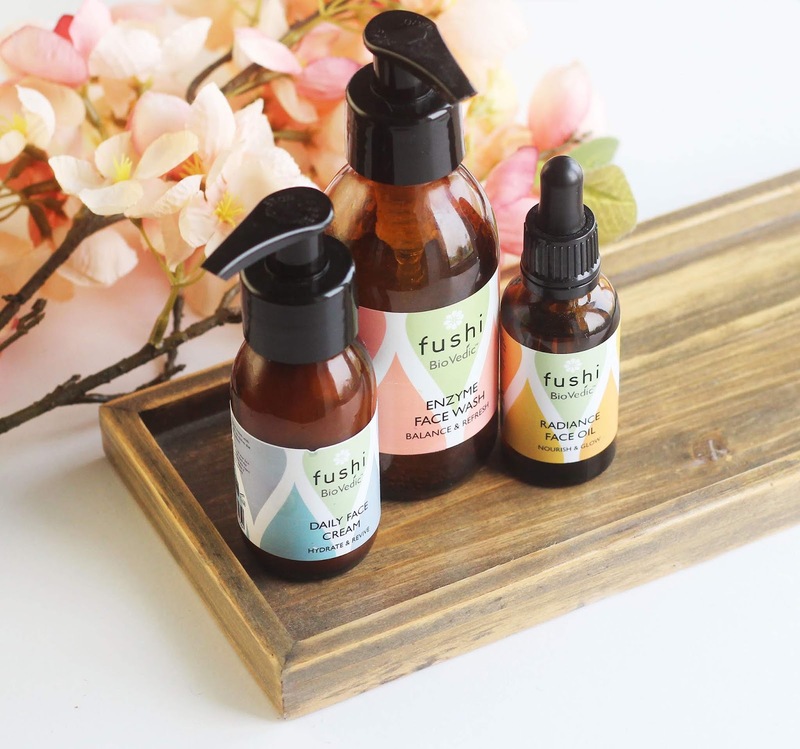 Shop My Picks What have you tried from this collection, or what would you like to you try? 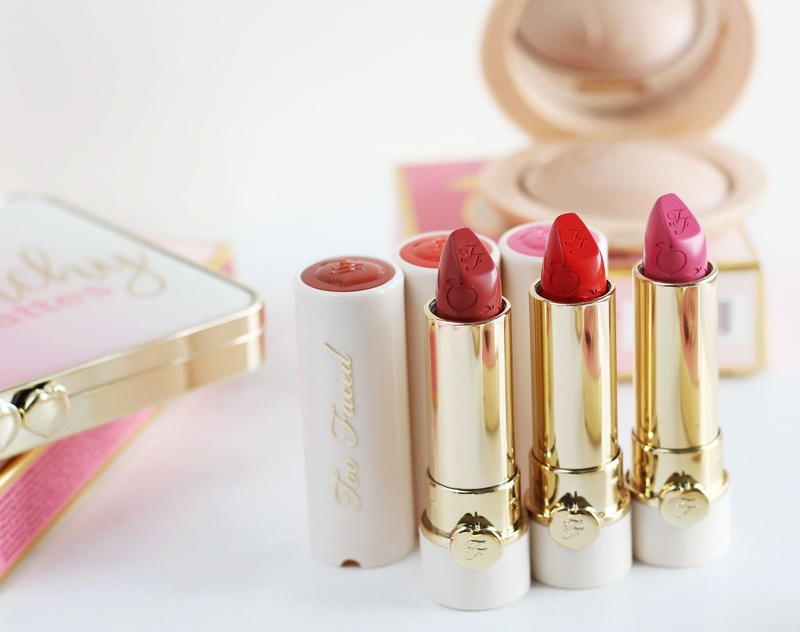 the packaging is so cute on this collection and those lipstick shades look great!! So cute , love it <3 ! I want to try everything! Looks amazing! I am loving the pink! Great review, thanks! That's such a shame about the foundation. I love their Born This Way foundation - but I have really pale skin so I might have to give the new one a miss! I love the packaging and the colours of the palette. Excellent review, thank you. I would guess that a primer being cooling would have something to do with tightening pores. Whether such a feature would actually work or not would be another matter, of course! It sounds like a really well-performing one, though; it's always worth keeping an eye out for those. I just adore this collection. 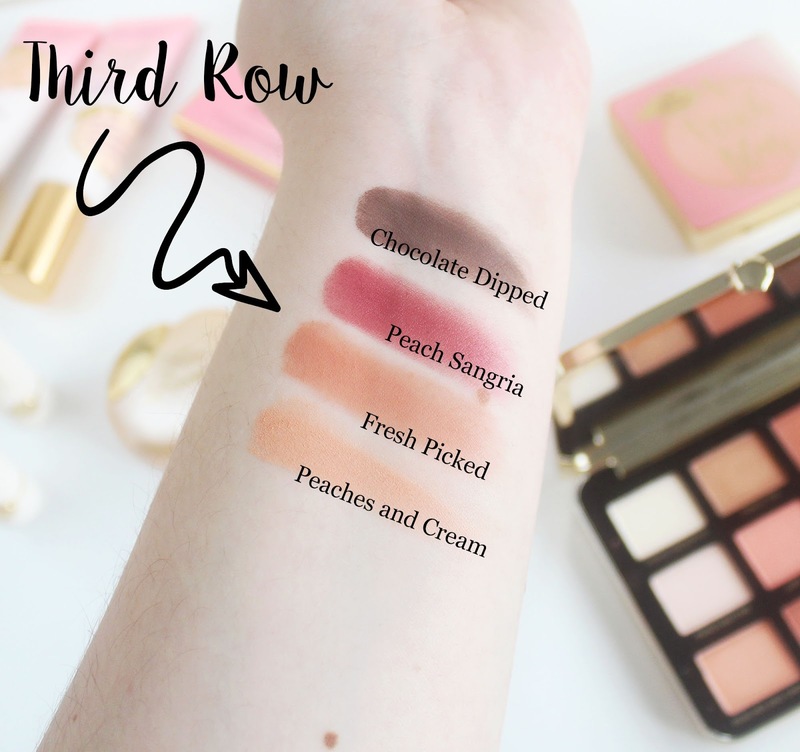 I think your swatch of Peach Sangria alone convinced me to try to get my hands on that palette! Love your photos too, very crisp and bright and clear! That palette is so beautiful!! Very nice post!! Thanks for the info!! These are lovely. I think the colours are all perfect. I just can't with the packaging. So cute! And the eyeshadow looks so smooth too, heart eyes all the way! Oh god you've made me want to try everything. 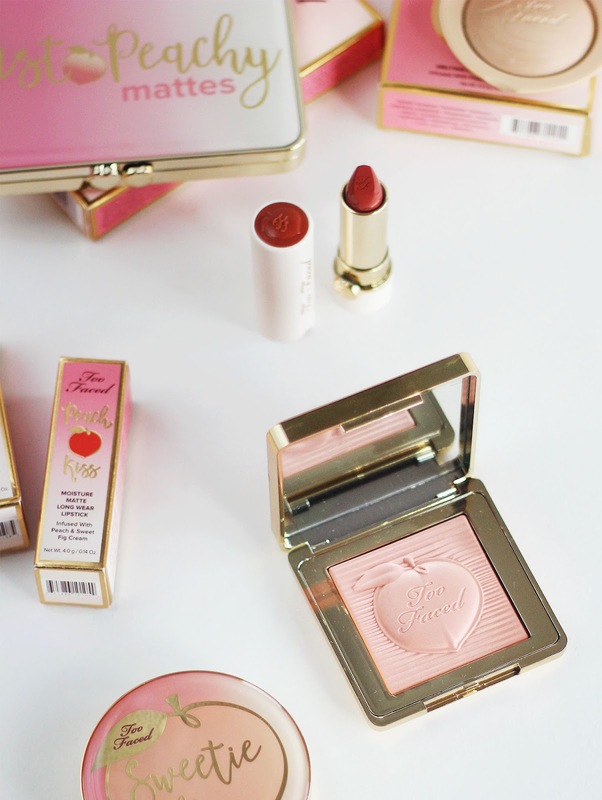 That sweetie pie bronzer sounds amazing, I love Too Faced's packaging it's always amaaaazing! what a selection of goodies what a treat this would be! I love the packaging and the colors, but I've read so many mixed reviews that I probably won't get anything haha Eyeshadows and lipsticks look just great! Firstly, can I just say your blog is so beautiful! The products look amazing, especially that bronzer and the eyeshadow palette! 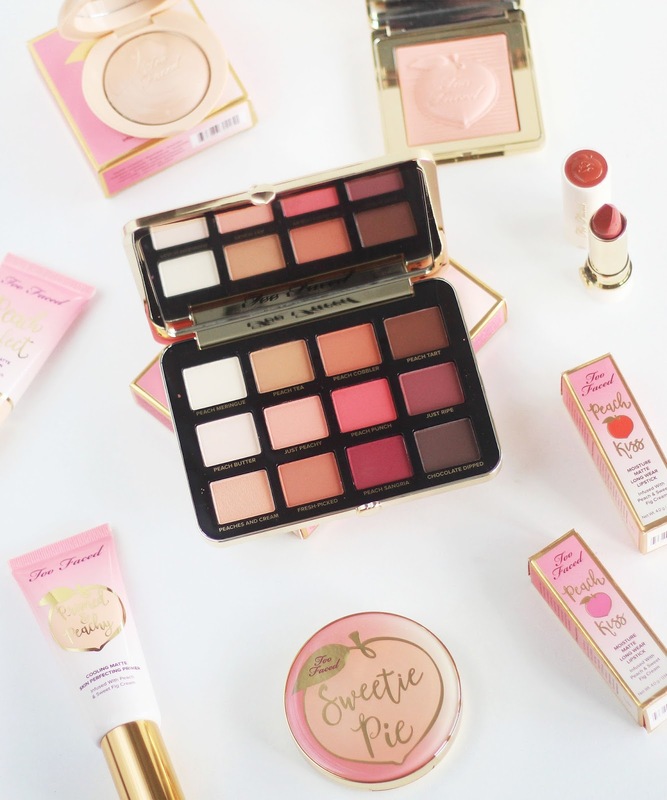 I've only tried one thing from Too Faced before but I really want to try some bits from this range. Beautiful post! I'm so jealous! I've wanted that peachy mattes palette for SO long!! It looks incredible and I've never tried any Too Faced products but these shades are completely me and I need it!! Really good detailed review of all the products! I'm obsessed with your photos! You captured each product so well! The packaging is so pretty! I've heard a lot about Two Faced products, I've been meaning to try their stuff out! Great post! This collection is a dream, I wanna try it! It’s sooo beautiful! Great review, amazing pics! I love the detail in your review and how you're so honest about the downside as well as the good things about the product. Beautiful range of make-up products. I would really love to try th Palette, please. Oh my 😍😍 the palette is goals! This is such a gorgeous collection! The palette is beautiful. 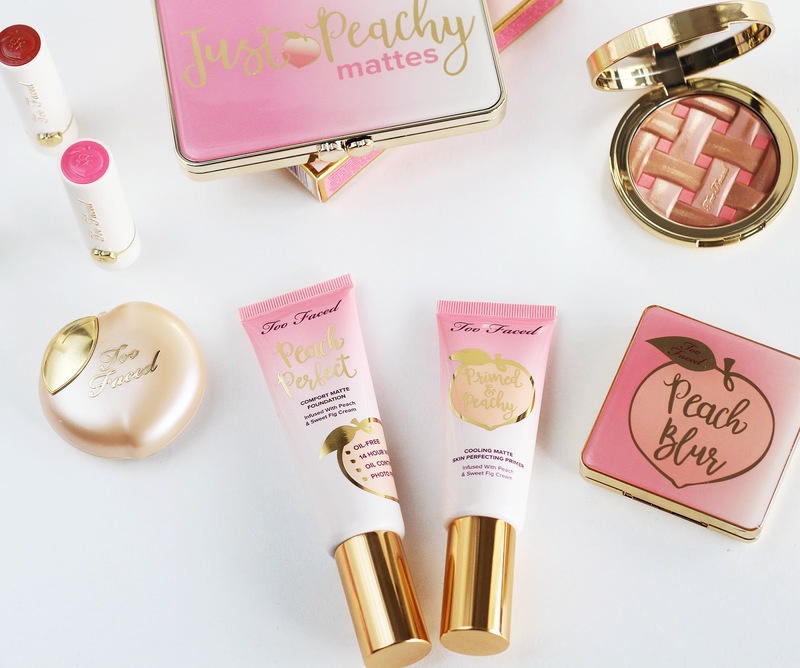 I love the peach collection, especially the primer! 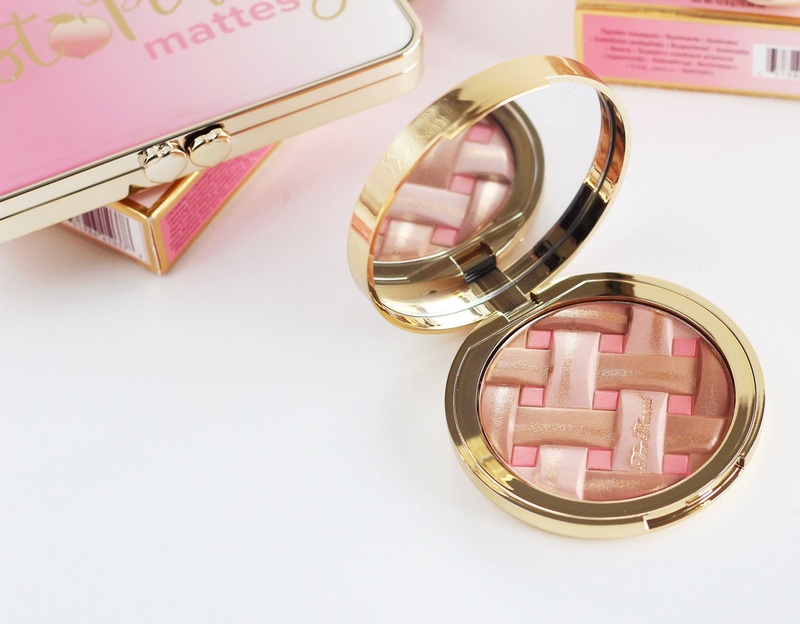 Sweetie Pie Bronzer - wow, looks amazing, wish I could see you with it on? I love this collection! The eyeshadow palette is so pretty! Wow. It all looks amazing. The eyeshadow palette and the bronzer are definitely on my Christmas list! I love the selection of colours in the palette. Looks amazing! 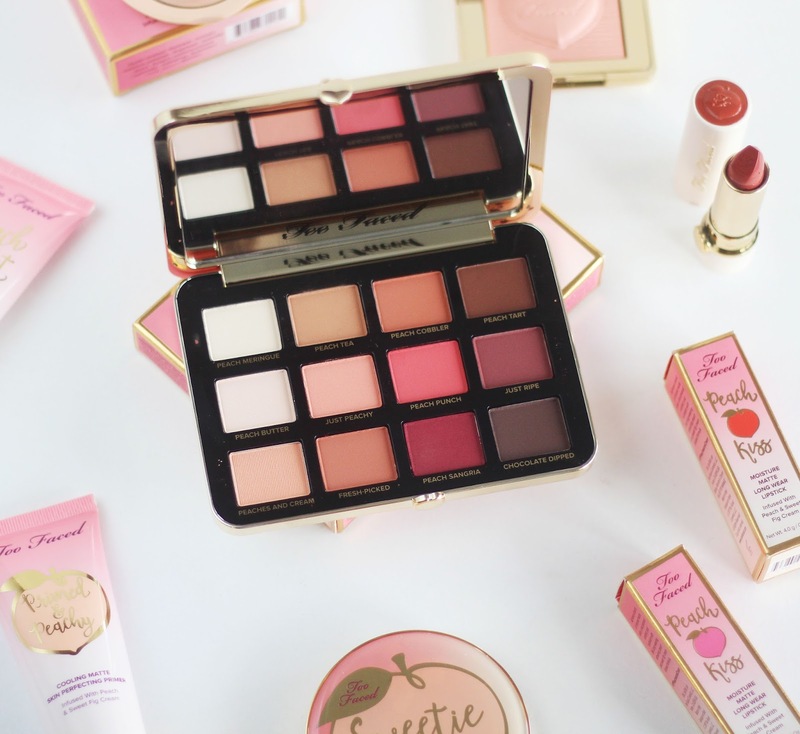 I love the peach collection. I would love to try the Sweetie Pie Bronzer. It looks a lovely colour, and wont make me orange! 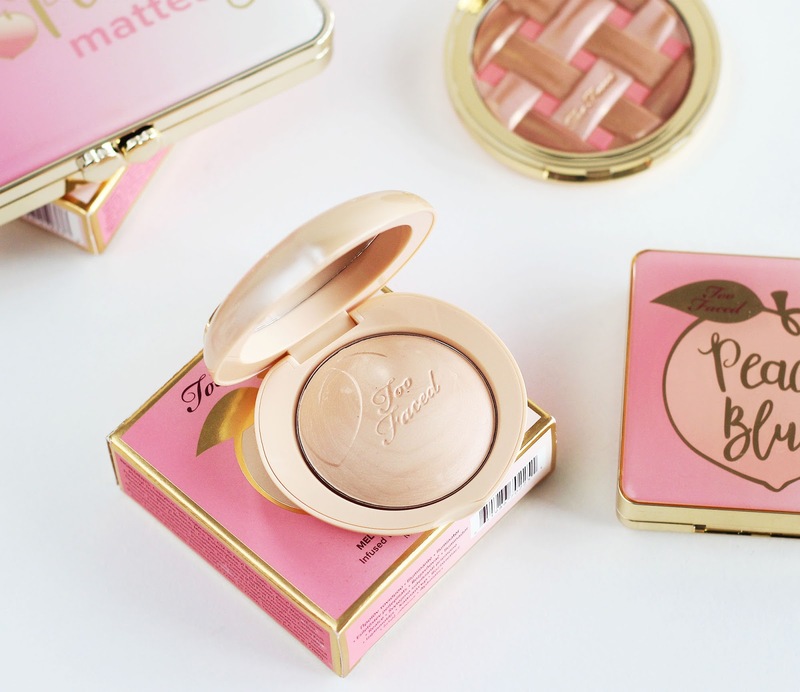 Ahh the sweetie pie bronzer is too cute!! I love that unique and adorable design. 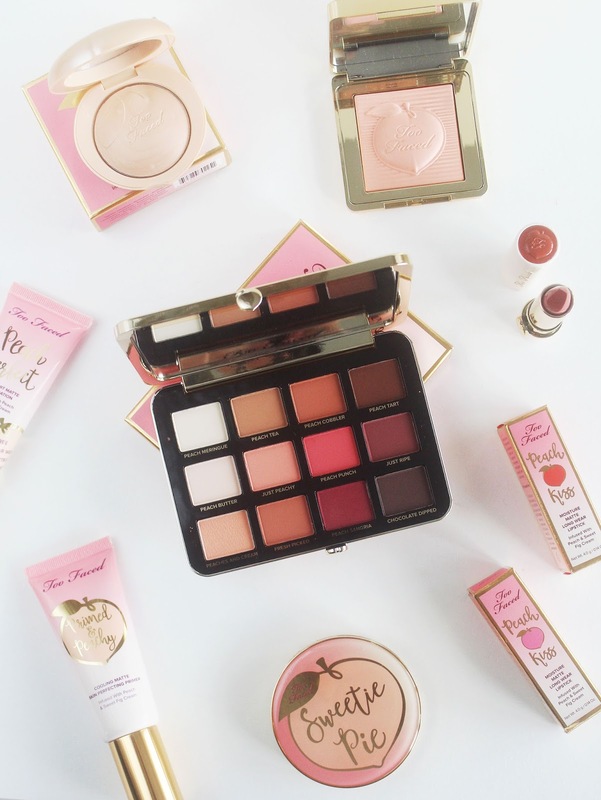 I absolutely adore Too Faced, the product packaging is absolutely adorable and looks simply stunning! Love the shades - never tried this brand. 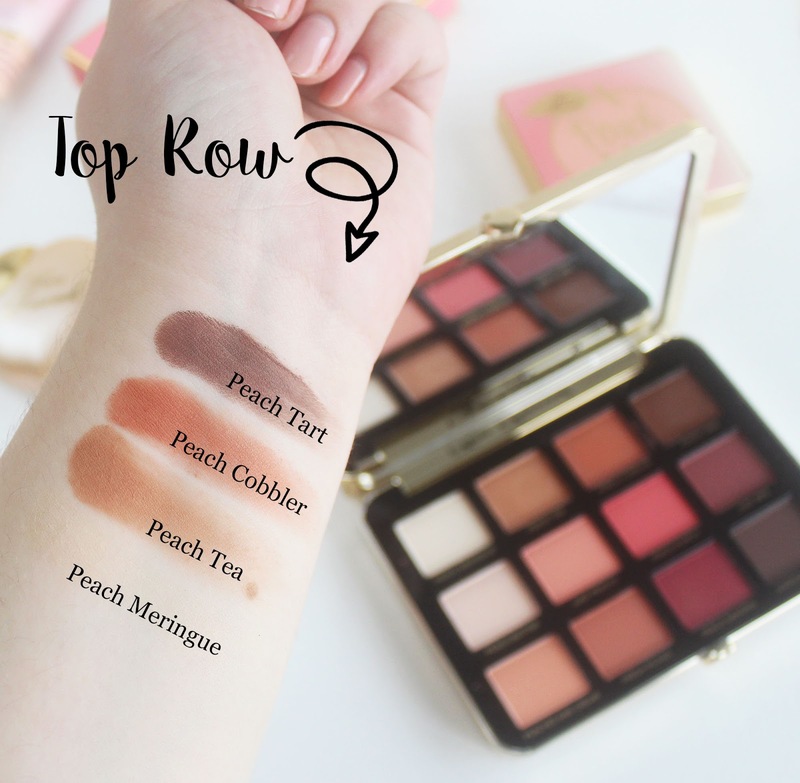 I haven't tried any of them as of yet but would love to give the Peachy Mattes palette a go. I think the foundation would be something I would try if had a lot of samples as would be gutted if like you I had chosen a shade I thought would suit me and it oxidised to make me look like a tangerine.